November | 2009 | ride.hike.eat. Last week on Friday, I spent the evening with Anthony Bourdain. I was watching an episode of No Reservations, when an obnoxiously loud commercial came on saying that I can catch Anthony Bourdain in Rochester. I immediately looked it up and it was true! The show was going to be at the Auditorium Theater. The description simply said “an evening with Anthony Bourdain”. I was sold! Both Joel and my brother were a little skeptical. “What exactly is he going to do?” they both asked. My answer was “I have no idea. It just says an evening with Anthony Bourdain. But does it really matter?? It’s Anthony Bourdain!” :) Kristin and her friend Jon decided to join us. The evening was set – dinner at Kristin’s, followed by the show, and then drinks and dessert at Good Luck. Perhaps the planets will align and he will somehow stumble upon my blog and read this post. :) Hmm… I can dream, can’t I?? Last night I participated in the Fast Friends Bakeoff. 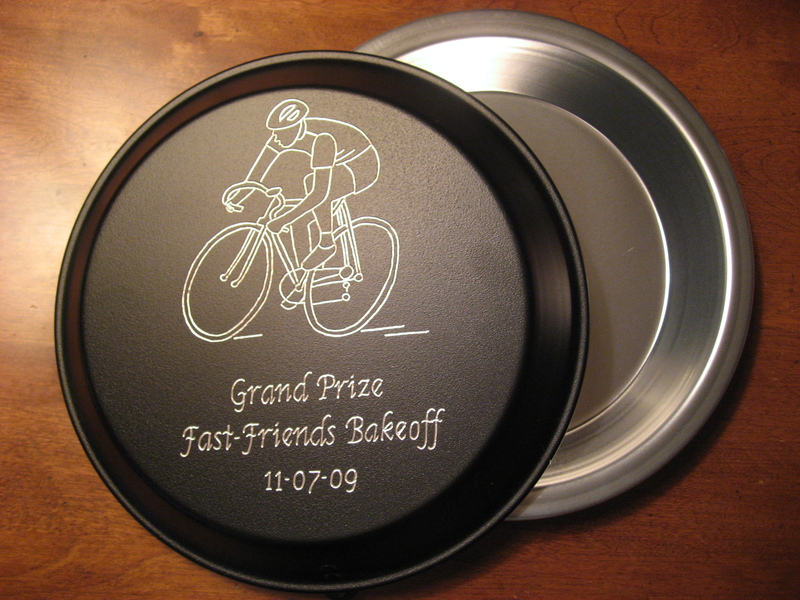 My cycling group, Fast Friends, decided to have a pie bakeoff, after a few of us bragged about our pie making abilities. My friend Cindy organized the whole thing. She opened her home to the party, created categories, ballots, and signs, purchased prizes, and even recruited celebrity judges to come judge it (thanks Scott and Kim!). The four categories were Appetizer, Main Dish, Desserts, and Unusual. I decided to enter the dessert category. The recipe required Anjou or Bartlett pears (I used 3 Anjou and 1 ½ Bosc pears), cinnamon, nutmeg, brown sugar, a little flour, lemon juice, salt, and vanilla. I decided to add some pecans, because I really love the flavor of pears with pecans. I also had some orange zest leftover from a pie that I baked last week, so I decided to add some of it into the pie. For the crust, I made my trustworthy Pate Brisee recipe instead of the provided pastry dough recipe. My trustworthy recipe is actually Martha Stewart’s Perfect Pate Brisee recipe. 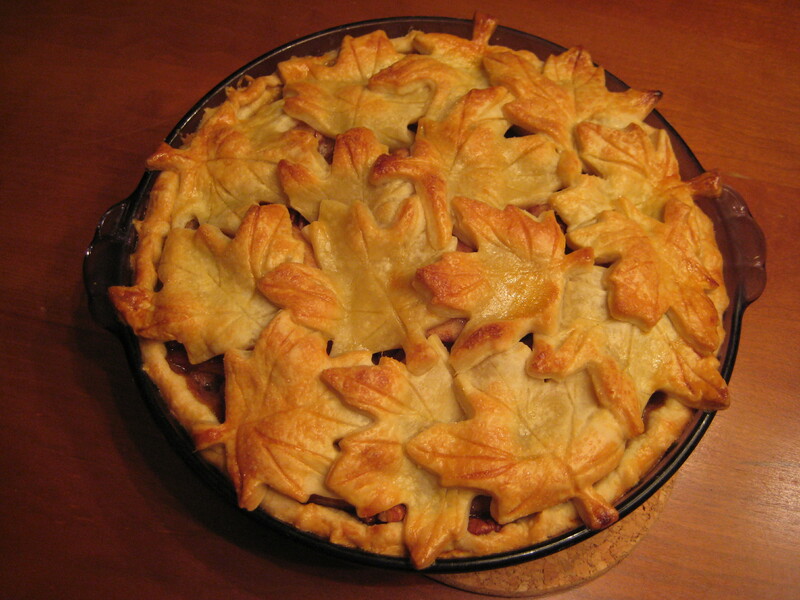 :) Also, instead of the traditional top crust, I decided to cut leaves using a cookie cutter, score the leaf veins using a knife, and then place them on top of the pie as if they fell off of a tree. It looked so beautiful!! I was very pleased. :) It smelled really great too. 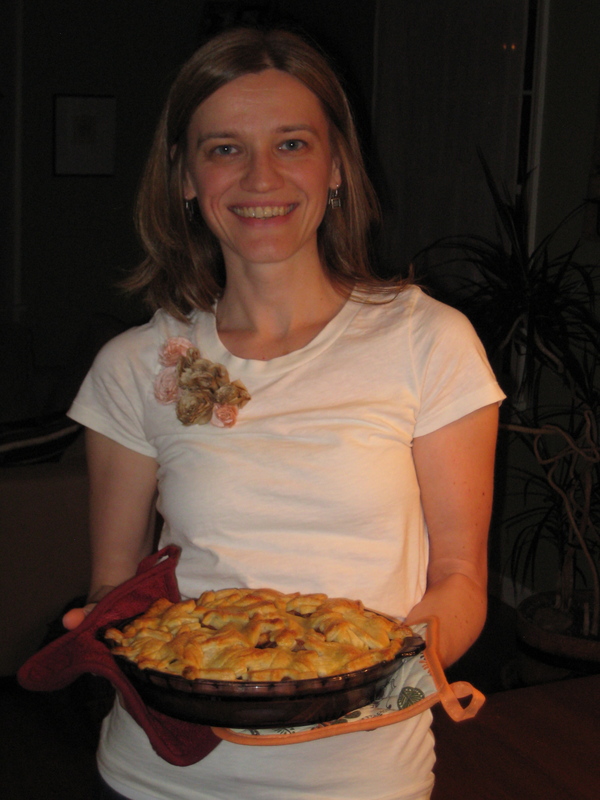 Also, the grand prize went to… my pie! I could not believe it!! I was really surprised. I would like to thank everyone who voted for it. I had a lot of fun making it. Also, a special thanks is in order for Cindy for organizing the event! I look forward to next year’s bakeoff. The place is a cross between a wine bar and a coffee shop, and is located in an old Victorian house. The house is beautiful, but the atmosphere was so-so. The “dining” area is separated into two rooms with stark white tables and dark comfy dining chairs (a nice touch). The walls were stenciled with gold Fleur-de-Lis emblems and crystal chandeliers were hanging from the ceiling. I was kind of put off by the still-lingering fresh paint odor as well as the men/women’s bathroom signs. They stuck out like a sore thumb. :( Both Kristin and I thought that they could have done better as far as the signs go. Also, it was a little too bright in there. Perhaps they should add a dimmer switch so they can make it cozier. Lastly, the pool table in an adjoining room was a little odd. I suppose it could be fun to play pool and have some wine and chocolate. Although, I am not sure that the rest of the guests would appreciate the noise. Now on to the menu. The menu contained a few pages dedicated to wine, a small section dedicated to beer and desserts, and a fairly large section dedicated to chocolates. The prices for the chocolates range from $1.50 to $2.25 (I think) per piece. Also, according to our waitress, the chocolates are crafted by a chocolatier from Miami and the desserts, including the cheesecakes, are flown in from Italy. After a long wait (I don’t think that they were expecting a full house), we finally ordered. We decided to share a bottle of red wine, a Merlot to be exact, which was very tasty and fairly priced, considering that it is a restaurant. Joel and I both picked 3 dark chocolates and Kristin picked 2 dark and 1 “non-dark” chocolate with hazelnuts (I can’t recall its name). The chocolates were pretty good. I would not rave about them though. The chocolates that I had at David Bacco Chocolats in Madison, WI were memorable. If you are ever in Madison, it is a must!! :) Also, Kristin read in The City that they are supposed to “focus on pairing wines and micro-brews with cheese, truffles, mousses, and other desserts”. The menu did not suggest any pairings for the drinks and desserts or chocolates. Asking our waitress for pairing suggestions was not very helpful. She did say that the red wine that we picked pairs nicely with the dark chocolates that we selected. That was not a big surprise. Any red wine pairs nicely with chocolate. Perhaps next time we should pick a beer and see what they suggest as far as the chocolate goes. Also, 4 out of the 7 desserts that they offered were cheesecakes. I was very surprised that they did not offer a chocolate cake. We mentioned to our waitress that it would be nice if they offered more cakes and less cheesecake. She was happy to listen to our feedback, which was nice. I guess they are still working out the kinks, since they have only been opened for a week. Perhaps I should give them another chance. One of my favorite RBC rides is the Powder Puff ride. Aside from the humorous name, which comes from the fact that the ride starts in Powder Mills Park, the ride is great. It includes a fast descent down Garnsey Rd and Steele Rd, a bunch of steep hills, including Woolston, Bluhm, and Thayer (just to name a few), and some fast flats. I love this ride because I can get a great workout even though it is only 25 miles. I also love this ride because it is very scenic and I can ride it from my house. I have done the ride a dozen times. It is my default ride when I do not have a lot of time to dedicate to a ride. I even signed up to be the ride leader back in September and next year just so I can ride it. Some call it an obsession. I call it a great ride. Yokko brought a delicious Squash and apple salad. To make it more festive, she cut the squash and apple in pumpkins, bats, and witch hats shapes. The menu also included Goat cheese and prosciutto quesadillas and Pumpkin chocolate chip bread for dessert. While waiting for trick-or-treaters, we started talking about this particular house in a neighborhood close by that has a gazillion decorations for Christmas. We decided to take a road trip to see if they did anything for Halloween. Oh, did they… need I say more?? I hope that all of you had a fun Halloween!